The Thai Ministry of Foreign Affairs gets upset easily as shown by the reaction to the granting of the 2017 Gwangju Prize for Human Rights (South Korea) to detained student activist Jatupat Boonpattararaksa, better known as Pai Dao Din. 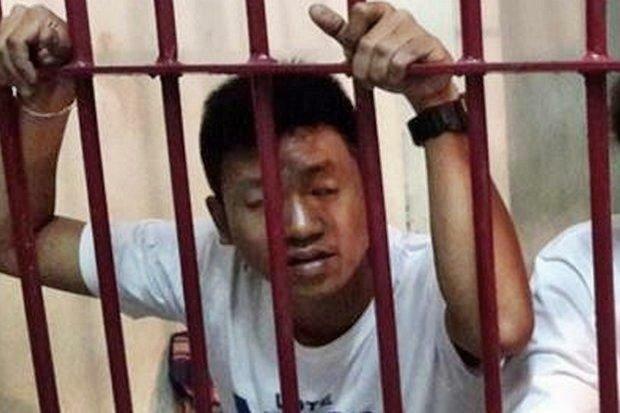 He has been in prison in Khon Kaen on lese majeste and computer crime charges since 22 December 2015, when 10 Khon Kaen University’s students from “Dao Din” group were arrested at the Khon Kaen Democracy Monument. 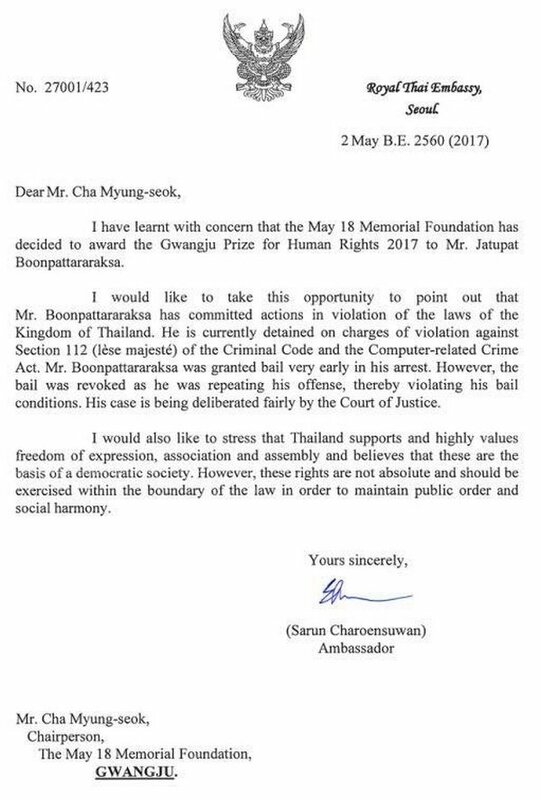 Now the Thai ambassador to Seoul has written to the human rights award giver in South Korea asking it to ‘reconsider ‘ honouring jailed activist Jatupat Boonpattararaksa. The detained defender had been hoping to make bail so he could attend the award presentation ceremony in person, but his request was denied. In refusing Mr Jatupat’s bail requests, the Region 4 court and Khon Kaen Provincial Court described him as a flight risk who could tamper with evidence. The laureate is thus unlikely to be abel to travel on 18 May to the award ceremony in Gwangju and Mr Jatupat’s mother Prim Boonpattararaksa and her husband Viboon will represent their son and receive the award on his behalf. National Human Rights commissioner Angkhana Neelapaijit, who won the Gwangju Award for Human Rights in 2006, described it as a prestigious accolade. reports that on 23 December 2015, the Supreme Court confirmed the 2012 sentencing of human rights defender Ms Chiranuch Premchaiporn to eight months’ imprisonment, suspended for one year, and a fine of 20,000 baht, for failing to delete allegedly offensive comments about the Thai monarchy, which had been posted on the now-defunct Prachatai web forum. Chiranuch Premchaiporn [https://frontlinedefenders.org/ChiranuchPremchaiporn] is executive director of Prachatai, an independent news website that reports on human rights, social and political issues in Thailand and Southeast Asia. She was the webmaster of the now defunct Prachatai web board which was set up to promote the exchange of information and opinion on Thai political and social issues. Chiranuch Premchaiporn was the recipient of the International Women’s Media Foundation Courage in Journalism Award in May 2011 and the Human Rights Watch Hellman/Hammet Award in September 2011. The Supreme Court ruling confirmed the verdicts of the Court of Appeals and the Court of First Instance, which were made against the human rights defender in November 2013 and May 2012 respectively. Chiranuch Premchaiporn was convicted under Article 15 of the 2007 Computer Crime Act (CCA) for allowing the alleged offensive comments to remain on the Prachatai web forum for 20 days. Article 15 of the CCA states that any service provider intentionally supporting or consenting to the importation of illegal computer content, as provided for in Article 14 of the CCA, shall be subjected to the same penalty as that imposed upon a person committing an offence under Article 14. Front Line Defenders expresses concern at the decision of the Supreme Court to confirm the sentence against Chiranuch Premchaiporn, and thus to continue the use of the Computer Crime Act to silence and intimidate human rights defenders in Thailand. Front Line Defenders fears for the potential chilling effect of the decision on the exercise of freedom of expression in Thailand, and the restrictive effect of this on the work of human rights defenders.